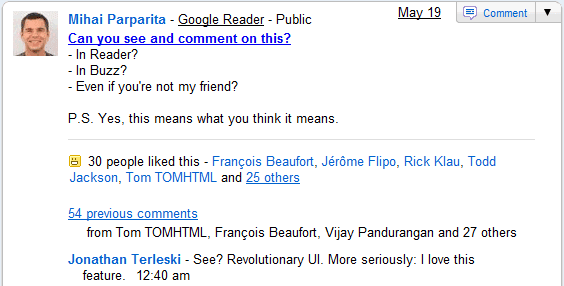 Google Reader simplified the commenting feature so that anyone can comment on a shared item. "Up until now, someone had to be in a designated sharing group to be able to comment on a post, even if you were sharing publicly. To make things a lot simpler, we've made it so that if you can see a shared item, you can comment on it." An important side-effect is that Google Buzz users can comment on any post shared in Google Reader, assuming that the shared items are connected to a Buzz profile. Since you can now comment on a Google Buzz post by replying to a message in Gmail, you could share a blog post in Google Reader and one of your Buzz followers could post a comment from in Google Buzz and then reply to your answer from Outlook, Thunderbird or from the Gmail mobile app for Blackberry. If you don't like Google Reader's interface, there are desktop apps like FeedDemon, NetNewsWire or Liferea that import your Google Reader subscriptions and synchronize your actions with Google Reader. That means you could share a blog post in FeedDemon and someone could post a comment from Google Buzz or from an application that uses Google Buzz API. While people can post comments to a Google Reader shared item in Google Buzz, you'll still see the comments in Google Reader. It's not really important where you find a great article and where you comment. In other news, Google Reader will drop support for outdated browsers (IE6, Firefox < 3.0, Safari < 4.0, Chrome < 4.0) and will remove the offline mode powered by Google Gears starting on June 1. Why not remove offline support when Google Reader implements the same feature in HTML5? Google Buzz içinden Greaderdaki öğelere yorum yapabilcekmiyiz? i think it's a good move to remove support for "antiquated browsers". Like they said, it gives time to do more constructive things. Given how js-heavy reader is, I'm pretty sure ie6 runs it slow as molasses anyway.